With the cost of petrol climbing steadily day after day the thought of driving your car less is very appealing. By cycling instead of using the car at every opportunity not only will you be saving money but gaining other benefits as well. Think of what we are doing to our precious atmosphere with the millions of cars that are on the roads. By taking up cycling you will be removing a little of the threat to our world and the world of our children. 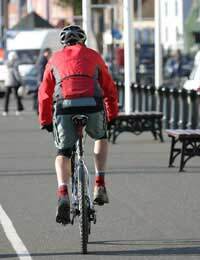 The only fuel expenditure of a bike is that which is expelled by the cyclist. Think how much money you could save if you did not have the upkeep of a car. There would be no expense of purchasing a vehicle or the added costs of rising interest rates if you took out a finance agreement to fund the purchase of the vehicle. Add to that the amount of money it cost in petrol, car tax and insurance plus maintenance expense and you would be much better off each months. Yes, there may be times when you need to use a taxi, bus or train but over all you would be making a big saving which could go towards your enjoyment of your downsized life. When cycling you would no longer be able to do a big weekly shop and would be limited by what you could carry on your bike. There are alternative choices such as internet shopping or perhaps sharing a lift with a friend but over all this would make you stop and think what you are purchasing and you should be able to see a saving in the household budget as you plan more carefully rather than shop randomly as you did when you had a car. When downsizing your life part of the reason would have been to stop the fast pace of living and relax. Riding a bike would make you look at your surroundings, enjoy the weather and feel healthier being out in the fresh air. Rather than take the heavily used main roads you will soon be cycling through fields and small lanes seeing parts of your town that you never had the chance to see before. Where as in the past you would have jumped into your car and gone out for day trips or driven long distances on family holidays you will now have to plan your outings when you no longer have a car. Although you would be able to hire a car for family holidays why not consider other options? Take a coach holiday. There are many companies who arrange short and long trips and they have pick up points en route which means you can be collected near your home. With the channel tunnel so easily accessible from mainline stations it is now possible to take a train holiday overseas. You can catch the fast link train from London and Kent though to the continent and enjoy a meal and comfortable seats during the journey and can also take the family dog as long as he has fulfilled the requirements of the pet travel scheme. By cycling instead of using you car you will be leading a healthier stress free life plus doing something constructive toward the state of our environment.